Tax reform, also known as the Tax Cuts and Jobs Act (TCJA), was enacted at the end of 2017, resulting in considerable changes to the federal tax code including a new limitation on the business interest deduction. Business interest expense was generally deductible under the previous law. Beginning in 2018, however, the business interest deduction may be limited to the sum of a taxpayer’s business interest income for the tax year and thirty percent of the taxpayer’s adjusted taxable income for the tax year. 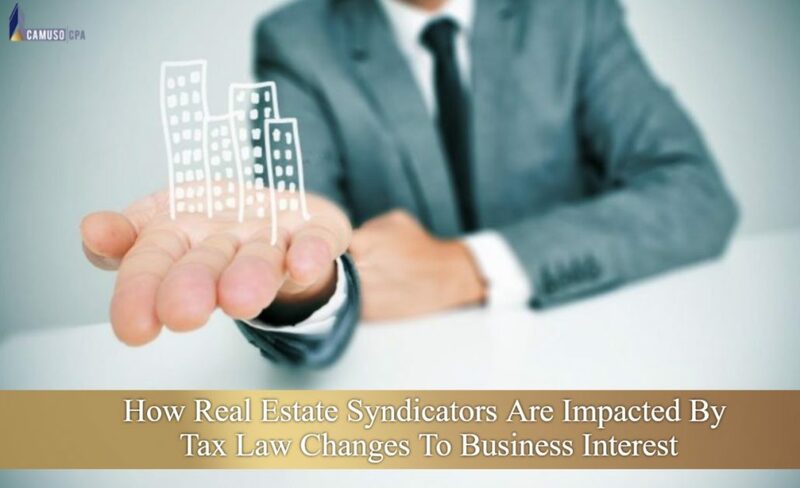 Syndicators can elect out of this limit by electing to be a real estate trade or business for tax purposes. The drawaback then is that real property has to follow a longer depreciation schedule. And may not be eligible for 100% bonus or accelerated depreciation on property with useful lives of 5,7, or 15 years. Syndications can be a powerful tax planning tools ,but can also have negative tax consequences if you’re not careful. Be sure to speak with a qualified CPA before investing or starting a syndication.